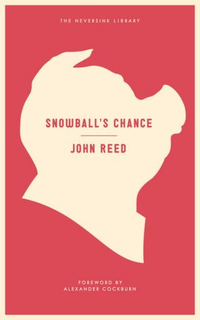 Snowball's Chance by John Reed. When the book came out, I related. I had the spirit to make a few insurrections—went to a Christopher Hitchens right-wing diatribe and corrected him from the audience when he talked about me. At my readings I drank more than usual and encouraged my audience to drink more, and to contribute animal sounds. I gave out rubber animal noses. (Oh, I wrote Snowball’s Chance just after 9/11: Snowball returns to Animal Farm, brings capitalism.) Then nine years went by, and, uh, I looked at the book again; a tenth anniversary reprint was in the works. I called James Sherry, the original publisher. The prose melted when I tried to read it. The thing was nonsensical. "James," I asked, "I don't understand anything in here, what does that mean?" "It means," said James, "you wrote it." Ten years. Just long enough to think, times weren’t so different, and just long enough to remember, yes they were. In 2002, blogs were for tech-savvy dweebs. Amazon was a book & crap bazaar. The Village Voice had a literary supplement, and cost one dollar. To find an article in a magazine, you had to get out of your chair, go outside, and go find it. To research a subject, you went to the library. People didn't throw up boutique lit journals in an afternoon. (I have one going official in September: statorec.com) You had to print on paper. You had to spend money, printing on paper, to have a publication. And then again, everyone made more money. Critics, writers, agents. And yet, why don’t I yearn for 2002? 2002—the end of an age. 2012—the beginning of a new age. But how to compare? What does one compare? And in what context? BIG PRESSES ✓ My first novel had come out with Delacorte, and there was a frenetic race to publish books about 9/11, and I had an enthusiastic and reputed agent, and it looked to me like Snowball would find a place at a big house. Then, the lawyers chimed in—the best guess was that parody was no longer protected speech in the United States. If anything, since 2002, the people of “big publishing” become more politically engaged. But traditional venues for book coverage—newspaper coverage, for example—are scarce in number and those venues that do remain are pinched and heavily reliant upon advertising, which necessitates ad-friendly content (the right demographic, the right message), which further pinches what books the newspapers will cover—what stories can be told. SMALL PRESSES ✓ I had always held out the hope that Snowball would find a place in paperback at a big house. We did get a few offers—but we always thought we could do better. Melville House, which was just establishing itself when Snowball came out, is now a lauded entity (Snowball is lucky to have them), and distributed by Random House. Overall, the small presses have a much better reach than they did in 2002—perhaps the best reach they’ve ever had. The caveats: there are legions of them, and many are publishing material that is, uh, not good. Of course, that’s a problem with presses of every size, and it’s very difficult to argue with any trend that localizes arts. DISTRIBUTION ✓ James Sherry, the publisher at Roof Books, knew that the challenge for Snowball would be distribution. We naively thought we could address it, but our schedule was too ambitious. We ended up distributing with SPD, Small Press Distribution, which is now one of the leading options for small presses. In 2002, the obvious best option was PGW, Publisher’s Group West, which offered a realistic alternative to Ingram. In 2006, PGW went into bankruptcy—caused by mismanagement. Not only did the bankruptcy leave the monolith, Ingram, the sole proprietor of major distribution, it cost publishers like McSweeney’s and Soft Skull whole seasons of earnings. Of course, ebook, direct, online retail distribution, have all become realities—but the lockdown on major distribution has become more pronounced, and is without doubt the single most horrendous thing about contemporary publishing. BOOKSTORES ✓ When Snowball’s Chance came out, despite the media attention, placement in B&N was a continuing battle. People walked into the store carrying newspaper clippings. Then, when Snowball sold out before the pub date, B&N didn’t restock. Perhaps rightly, the store that ordered the most books—I haven’t since seen so many of my books in one store—was St. Marks Books, about a block from my apartment. While the small presses have penetrated the remaining big bookstore (B&N), the small bookstores are vastly reduced in numbers, and less likely to offer alternative perspectives on culture—rather, most small bookstores have become “better” versions of the big bookstores, their list is more selective, their emphasis more literary, but it’s the same span of books you’d find in B&N. ONLINE BOOK SALES ✓ 2002, online book sales were still speculation. What mattered to Snowball was bookstore distribution. But if Amazon wasn’t yet significant competition, it was looked on, quite accurately, as the threat to in-person retail it would become. Online books sales, not just through Amazon, have allowed for a major change in what can be published. “Outliers” are possible, and books with specific demographics can distribute directly to their markets. Books can be printed one-at-a-time. Huge steps in the history of human knowledge. EDITORIAL ✓ James Sherry, who edited Snowball, is a brilliant editor. I’m afraid the kind of work he did on Snowball isn’t something that one would be likely to see today—not at a big house, and not at a small house. Book editors edit less. But in terms of magazines, journals and whatever other literary venues, there are excellent editors, and more of them than ever. I’m finding myself writing numerous essays—stuff I couldn’t have dreamed of doing in 2002. (Including this piece for Ed Nawotka at Publishing Perspectives.) The essay is in a period of Renaissance, and online editors have been disencumbered of the costs and responsibilities of print. THE WRITING ITSELF ✓ In 2002, you went to the bookstore and looked around. Now, people make their choices, and their choices are influenced by what they see online. Those who are able to resist the constant temptation of propaganda and idiocy are able to employ the internet to inform themselves on subjects of interest and personal aesthetics. It’s that population of people—among the what? six million writers?—that has raised the overall quality of U.S. creative writing. With distribution as is, however, there’s not much evidence of that in the marketplace. STATE OF NARRATIVE ✓ The traditional venues of book coverage—major newspapers, etc—are flailing to attract advertisers. Their readerships are shrinking, so they tell advertisers they have the “right” demographic. People who buy, who buy to be, who value money, who value the making of money. To attract the right demographic, editors, for example, gear their content to sync with the desirable demographic. In finding that demographic, the venue further shrinks its audience. Vicious circle. Snowball isn’t telling the story it’s supposed to tell; it’s not a “coming home” story. (“Coming home,” the comedy of Greek drama, is the go-to story of the marketplace. You participate in culture, you “buy in” and you find happiness.) I’d be delighted to be proven wrong, but I’m guessing that Snowball, as in 2002, is more likely to see political coverage than books coverage. ECONOMY OF WRITERS ✓ Advances have gone down, payments for journalism/reviews are laughable or not there at all—and yet there are new opportunities, ebooks, interactive, etc, and being a writer, it seems to me, isn’t the act of immolation it once was. Maybe that’s just me, of course—it could be my unfailing optimism. Go buy a copy of Snowball and join me. DEMOCRACY OF LITERATURE ✓ Email me and we’ll talk about it. jr @ johnreed.tv That’s the up side. The internet makes discussion, even radical discussion, a plausibility. Without the internet, I doubt Snowball would have participated the way it has. (I can’t tell you how many people tell me they’ve read the book, people who I quickly realize are just saying they read the book, which is heartbreaking, but I suppose they’ve heard of the project, or they wouldn’t bother to lie about it.) The downside to democratized arts: the normative conversation is dull, facile, and filtered by servile and/or oligarchical thinking. READERSHIP ✓ Readers can find what they’re interested in. They’re more informed about what they’re interested in. They can tell other people about the things they’re interested in. They can “network” based on what they’re interested in. All this was just starting in 2002. Now, it’s part of how we live and experience books. LITERATURE IN EDUCATION ✓ Blind, unthinking hero-worship is characteristic of an educational system dominated by a cultural hierarchy. “This is great because we told you it’s great.” It’s not surprising that in our ever more atavistic and conservative creative economy, the bullying in U.S. education has only gotten worse. It’s difficult for me to see much of an upside, have much optimism, about the academy’s mind-numbing approach to “classics.” At least I no longer have the sense that I’m in total isolation. Attacking classics, whether it’s Jonathan Lethem or Zombie Jane Austen, has become a category—and it’s a badly needed conversation. SELF-PUBLISHING ✓ The same day I talked to Dennis Johnson, the publisher of Melville House, about the Snowball paperback, which would make me about .85$ per book, I talked the to “curator” of an ebook series, which would make me 1.70$ a book. And the ebook would only be 15,000 words. Snowball is about 35,000 words. The downside to self-publishing: self published books are self published (the overall quality is often very low) and if you don’t understand the book business, if you don’t have a highly specific and active market—the unicorn vampire market, for example—you’re probably killing your baby. LITERARY CULTURE ✓ In 2002, I had very little awareness of thriving literary communities outside New York City. Now, I know for a fact they’re all over the place. Local arts, local writers, local collectors, local readers. Deeper thinking and the engagement afforded local communities. And these communities aren’t just a geographical occurrence—communities are forming around interests, passions, common causes. COPYRIGHT ✓ While the copyright claims against Snowball, i.e. those of questioning the legitimacy of parody, are no longer viable, in the last ten years, we may well have seen the birth of perpetual copyright. Uh, for large corporations that is. PARODY ✓ 2002, it looked like parody in the United States was over. But by a miracle—an American miracle—parody was staunchly defended by a conservative Supreme Court. Furthermore, the U.K. has set about reviewing its stance on parody (they want the income that comes with the full dose of parodic entertainment, The Daily Show, etc). Snowball, threatened by the Orwell estate in 2002, is not currently under any legal danger in the United States—and the debate on parody in the U.K. points to (hmm would it be all right if I ended patriotic?) one of two outcomes: either a U.K edition of Snowball, or the continuation of a total inability of U.K. entertainment to compete with upstart Americans.